I'm Thinking Happy | …..and so should you! Wow. I started this blog back in 2011. At the time I had 3 followers: Myself, my mom and my dad. Now I have 125 followers??? thats pretty cool. This blog has evolved and grown as I have and I’m excited to see where it goes! Much love to all my followers both Old and New! The school year is well underway by now and definitely running full force this week. This means lots of homework, sports, learning and lack of sleep… I’d like to very honestly say I enjoy school, I love learning. At the same time, I don’t look forward to the school year. Why? Because of everything that comes with it. The late nights, followed by early mornings. The added workload after school that takes away from family time and just plain old chill time. That all disappears when school starts (hence why I rarely post during the school year). It’s the aspect of school that follows me home I don’t like, not school it self. I spend from 8:15 – 3:15 at school, then go to practice (for my school team). I get home around 6 have dinner and then do at least 2 more hours worth of school work. And that 6 pm home time is on practice days, if we have a game I end up getting home sometimes as late as 8 pm. So yeah, I’m not a fan of homework… can you tell? Don’t get me wrong while homework is not my favorite I can see the need for it. Certain things are beneficial, like say, reading a story before class so as not to spend class time on it, that I have no issue with. Though, when it’s just work for the sake of work, or repetition in excess, that frustrates me to no end. I’m talking about when you stay up late reading or doing an assignment only to find out you’re not actually working with it until later or sometimes even not at all — or worse — when you get to class and go over the entire homework and relearn what you did the night before. Homework like that creates stress, and stress doesn’t allow you to learn no matter how you slice it. Thanks for reading my lil rant here! And please don’t take it the wrong way, I do love (most) of my teachers and enjoy learning, I just think there’re some issues with the system (actually there’s a lot — don’t even get me started). If you agree or disagree comment, like and/or rate below! This Blog has evolved quite a bit over the years, as has my posting frequency. I am now 15 years old and I started this blog about 5 years ago as a slideshow of pictures with captions. It has since been a quotes’ blog, life blog and book review blog separately. In the past year or so, my posting has dwindled to about none. I would like to change that and the only way I see that happening is by making this a nonspecific blog while I work on figuring out where I’m heading. Meaning, I will be trying to post something on a regular basis but that could be anything from a quote to a book review or new idea to — infinity and beyond! I’m sorry for all these changes and hope you continue to stick with me on this journey but I also understand if you want to jump ship. Love to you all!! Tweet Tweet this book was sweet. 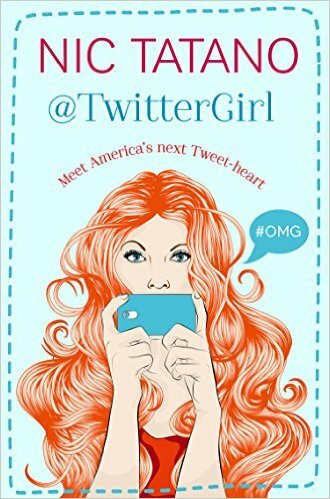 I read TwitterGirl back in May of this year. Nic is truly an amazing author. While I haven’t read anything else (nor will I probably read anything else) by Nic Tatano, I really enjoyed this book. It’s hard not to fall in love with some of our male characters here and I think every girl wishes to have even just a spark of Cassidy’s sass. This book has it’s laugh-out-loud funny part yet still has a captivating plot. Filled with unexpected as well as easily predicted twists this was a fairly fast read. However while I mostly read what would be considered young adult (YA) novels, this is not. I would recommend TwitterGirl for ages 16-55. This is defiantly a chick-lit (like a chick-flick but for books -literature- not movies). TwitterGirl definitely has it’s romance going, and a fair share of” awes” and “ohhs”. Some slightly mature subjects were discussed but nothing you wouldn’t find in a PG-13 Movie. Rating wise I would give this an 8 out of 10. While I loved TwitterGirl it’s not really a book to write home about. Definitely a good read but not a life changing oh my God wow type of a book.